Dr Bidda Jones is the chief scientist at RSPCA. This week we profile Dr Jones in Changemakers - a regular column which examines inspiring people and their careers in the Not for Profit sector. 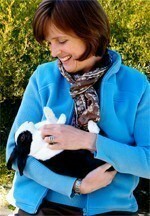 Dr Bidda Jones is the chief scientist at RSPCA. This week we profile Dr Jones in Changemakers – a regular column which examines inspiring people and their careers in the Not for Profit sector. RSPCA Australia is the federal body of the eight autonomous state and territory RSPCAs in Australia. RSPCA Australia establishes national policies and positions on animal welfare and liaises with government and industry on national animal welfare issues. In my role I have to cover a broad range of animal welfare issues, from puppy farming to kangaroo management and many things in between, but one enduring theme is the RSPCA’s long running campaign to end the cruelty associated with the livestock export trade. This week I’ve been documenting the mistreatment of Australian cattle in footage taken in an Israeli abattoir as well as visiting Portland in Victoria to look the arrangement for sheep prior to export as part of a review of government standards for the industry. Whatever I am working on it’s my job to represent what’s in the best interests of the animals involved. Most of my working life has been in Not for Profit organisations – I’ve been with the RSPCA either in Australia or back in the UK where I started for 20 years. I’ve been very lucky that I’m in a role that uses my training in zoology and animal behaviour but also links in with policy and campaigning work. I can’t imagine ever leaving the NFP sector as it’s been the source of an incredibly rewarding career so far. The RSPCA is the peak animal welfare NGO in Australia. It’s an organisation with a powerful history of preventing animal cruelty and it’s great to be a part of that story. Working for RSPCA Australia, I not only get to make a difference to the welfare of animals on a national scale, but also to be part of a group of incredibly committed, enthusiastic and supportive people… and their dogs! (well-behaved dogs are welcome in the RSPCA Australia office). It’s a hard combination to beat. How I cope with having to watch footage of animal abuse. I can’t pretend it’s easy but I think having a science background is a big help. I’ve learnt to separate out my emotional response from my role in documenting and commenting on what animals are experiencing. It’s really important for me to remain objective as it strengthens the RSPCA’s case – but it’s sometimes easier said than done. I’ve been travelling a lot so I am struggling to read all my emails at the moment! But I’ve just bought Ben Goldacre’s new book Bad Pharma about the how the global pharmaceutical industry misleads doctors. That is sure to raise my ire. But usually I read novels rather than non-fiction. I’ve just finished a hilarious book called Come Thou Tortoise by Jessica Grant that was sent to me by a very kind friend. She picked a great book for me to escape into and laugh over. This summer I’m looking forward to reading Hilary Mantel’s Bring up the Bodies, but I’m going to need some serious time in a hammock for that one. Anyone who can rock up to a media interview or presentation and speak well without notes. I am in awe of such people as I never feel that I will remember the right things to say unless they’re written down, even though doing media interviews is a big part of my job. My children are both into public speaking and debating and I’m always inspired by their confidence and ability to speak off-the-cuff – they didn’t get it from me! I have watched some of this footage and have left the room in tears, unable to view anymore. I understand that this mistreatment of animals is worldwide and not just Indonesia, Israel etc. Each country is guilty of this. I am from the UK and have heard from ex slaughter employees how they entertain themselves through the mistreatment of animals from the South West region prior to slaughter. Until we all become mindful of where the meat on our plate comes from, our animal friends will be massed produced & slaughtered by mindless dimwits whom have no concern. I wonder how we can ever put an end to this?? It can be done but we have to make the ‘general’ public (who are totally unaware or arrogant) see what happens to get their meat on a plate.